Wonderful Executive Home in Avila, Tampa Bay's Exclusive gated Country Club Community. This single story home has it all. The bright open floor plan, featuring an impressive arched foyer entry with marble flooring, offers 5 bedrooms, 3-1/2 Baths, Formal Living Room, Dining Room, huge Family room with fireplace, wet bar, an additional bonus area for pool table, and inviting Florida room beyond. The spacious Master Retreat is privately located, and there is an additional large bedroom, which is suitable for an in-law suite, having its own private entrance. Most rooms are overlooking the tropical pool and large fenced yard. Two gas fireplaces, circular driveway, impressive fountain that greets you as you approach the arched entry, mature landscaping, are a few of the many amenities you will discover. 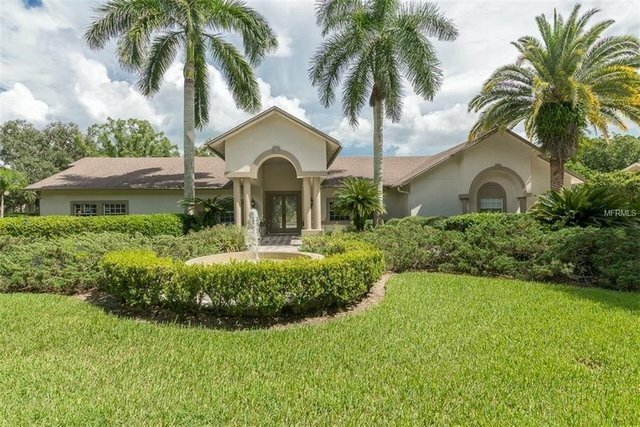 Enjoy the Florida lifestyle in this fabulous home!